Setting aside his early political cartoons for the UCLA school newspaper (he majored in economics), Raymond Pettibon's first major break came from doing concert posters and album covers for his older brother Greg Ginn's band, Black Flag. 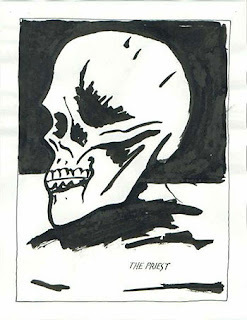 The Priest comes right from the moment when Pettibon was beginning to make major roads into the high art world with a series of major gallery showings. Within two years his work would provide the cover for Sonic Youth's Goo album, solidifying his ascent. For his artistic practice, the period was also deeply transformational. While early drawings tend to contain a punch line (however perverse), later drawings become filled with more text and, consequently, ambiguity. Pronouns become linguistic shifters (see Roman Jakobson) in these works, they are (to use Saussure) signifiers with multiple possible signifieds. Here Pettibon accomplishes the a similar feat with only two words: "the priest", and the viewer again becomes responsible for crafting their own interpretation. This is one version. 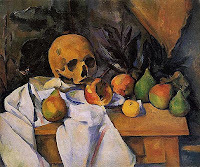 The scene is a memento mori of the type that flourished in still life in the seventeenth century and remained a common genre of painting into the twentieth century for Cezanne [pictured at left] and Picasso. However, unlike nearly every other example in the field, it sits alone; there are no remnants of worldly life and thus closely mirrors Warhol's skull paintings from the 1970s [pictured below]. This is almost certainly deliberate, as Pettibon repeatedly adopts the motifs of many of the great Pop stars in his own drawings. The concept of a memento mori comes from the very beginning of Ecclesiastes: "Vanity of vanities ... all is vanity." Every living person will die, he reminds the reader, and worldly pursuits will be rendered meaningless. It's tempting to suggest that the text sits as a label for the skull: this was a priest who also died. This is impossible to disprove. It is also possible that the words may refer to the preacher Ecclesiastes himself, bringing him into the drawing for commentary. His words only a few lines down in the Bible fittingly describe Pettibon's process: "there is no new thing under the sun." There is nothing left to do but recycle old images, paint the same paintings, it first seems to suggest. That's not a particularly optimistic message. 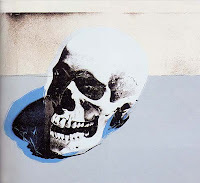 (Of course, Warhol's is perhaps even less so, capturing a skull divorced from any human trace: death is the only reality.) The trick, though, is that Pettibon has actually created something new. Grafting together text and a drawing, he disassembles the history of the memento mori painting, arguing that death may not be entirely final: Ecclesiastes was wrong. Art can cheat it.